This week's preschool story dance class was about being thankful, but it almost wasn't. I had actually planned to do "Peaceful Piggies" since we did not have class last week. Then I realized that this was their last class with me before the holiday. I did not have a thanksgiving book in my stash, so I decided to visit Ms. Melanie. I knew she would have some good books on this very theme, and she did! 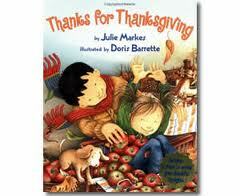 On her book shelf was Thanks for Thanksgiving by Julie Markes. I am thankful for Ms. Melanie! Each story dance class begins with the snake breath. This helps get the kids to quiet their bodies while being active and engaged. Letting out the S sound requires them to exert some energy and there is only so loud one can get while making it. It also catches on quickly. If the group is getting too noisy or losing focus, I start the S sound and everyone joins-in pretty quickly. The "Snake Breath" is new to my classroom management repertoire and is proving to be a reliable tool. Then I introduced Ms. Melanie's book. The author talks about being thankful from a child's perspective. She describes being thankful for swings, slides, play-dates, kittens, puppies, school, mommies, and daddies. When we read each page, I asked the students to do a "thumbs-up" if they were thankful for those things too. This book was nice for the preschoolers because the sentences were not too long and the language was accessible to their lives. The illustrations were detailed and colorful, filling-up every page. After the story, I used a ball from the classroom to lead a sharing circle. I make eye contact with each student and ask them the same question. Today's question was what are you thankful for? Whoever I roll the ball to answers the question. I heard lots of mommies and daddies, brothers and sisters, nannies and poppies and, of course, toys! Since this is story dance class, after each student answered the question, they got a turn in the middle to dance on the leaves to the tambourine. Oh yes - the author was also thankful for fall leaves, so that worked out nice. I transitioned the children to the yoga dance party by revisiting yoga poses from previous classes. I had displayed a few yoga cards for visual assistance. A very adorable moment occurred when one of the little one's took notice of the cards and totally lit-up. I could not help but smile at his reaction. He got very excited and started recalling other poses from the book we had read last time. After reviewing the cards and poses, I called them-up to turn-in their story squares by color. I also turned each color group into either "mountains" "trees" "triangles" and "twisty pretzels." Then we had a yoga dance party. I am thankful for my colleagues, my students, my family, and friends. I have a great group of girls for the hour long story dance class. Last week was our first class together and it went great. For the cool-down at the very end of class, we sat in a circle, and I asked the group of inner city 5-8 year old girls to each tell me one of their favorite books or stories. We went around the circle, the answers were...concerning. The first response was Justin Bieber. (pause). Do you have a book about Justin Bieber? Yes. (ok well, at least she's talking about a book). Most of the girls when asked this question gave answers that seemed odd, I think there were more movie references than anything. One girl did have a book of all the princesses. Another girl said that the book we read that day for our class (Dance with Me by Charles R. Smith Jr. - also in book recommendations) was her favorite. I told her and the other girls that any of the books we read in class, they can find at the library (which you can almost see from our building). There was a little bit of an excited buzz that went around the circle. I wonder what kind of exposure these girls are getting to good books? Who models good reading habits for them? Have they ever even been to the library? Based on the answers of the previous week, I decided to incorporate "book time" into this week's class. I brought a stack of age appropriate books that I have in my collection and put them out. I was going to save this as an end of class activity, but they were so excited to see the books, they just picked them up and started looking at them, reading them, and asking me and the staff person to read. So instead, I set the timer for five minutes, and told them when the timer goes off, we will put the books away and start our warm-up. I love that a major part of my job is to get kids excited about reading. It was working with at-risk girls like these and recognizing the need for more exposure and opportunities with literacy that got me to start incorporating more and more literacy into my dance classes. Now it has become a class of its own and the format seems to work really well. I like, and I believe the kids also like, having fun kinetic experiences with language and literacy. There is also music, and instruments that come out sometimes, we write words on the board, and look at the pictures in the book, sometimes the girls read the story along with me. Story Story Dance! has all the learning styles covered. Book time is now an official part of this class for my girls group. I am so glad I decided to bring all the other books. It was a last minute on a whim thought. The books were already in the backseat of my car not doing anything, so I grabbed a bunch and brought them in with me. Sometimes when I am planning a class, it happens all it once. I get a creative surge and I just have to go with it and it completely consumes all my thoughts. Sometimes that happens the day before the class I am going to teach, like today. I was thinking about building-off of last week's yoga book with Peaceful Piggy Yoga by Kerry Lee MacLean (read more about it in book recommendations). I originally wanted to bring in a stuffed animal pig to embody "peaceful piggy," but on the day I went to search for one, I came up empty handed. Now here I am the day before the class with no little piggy to bring. So I start rummaging. Because I have been doing this for 10 years, I have accumulated many odd things, because in the mind of a drama teacher - I could use this one day! Today, that day came. I pulled out one of my "bins-o-things" and what do I see staring back at me? Two pig masks that I made years ago! yes! These were prototype masks, but perfectly usable. They are made from a soft pink foam and already cut to shape. I added the noses, and some features with pink felt, to try to soften them up (pig masks are a little creepy, but hopefully in the context of the book, it will all go ok). As I continued to rummage, I found enough other props so that the peaceful piggies can get into their characters that appear through the story. For instance, I have kerchiefs for the cowboy peaceful piggies, I have fancy waist wraps for the ballerina peaceful piggies (in lieu of tutus), and I have fancy scarves for the movie star peaceful piggies. Throughout the book, I will call up two students at a time to put on the peaceful piggy mask and accompanying costume pieces, and teach the class the pose. And then we end class with a dance party of course! Since yoga freeze dance went so well and we are still on this yoga theme right now, I will probably end with that. After the dance party, I will have them do "corpse pose" from the book. Having students lie down on their backs at the end of physical activities like this is good to help them calm down and breath properly. When I was training with the teachers at Dell'Arte, one of my mentors ended her elementary aged drama classes with "Graveyard." In this game, everyone lies down on their backs and they cannot move. If you move, even a subtle inch, she would go over to the student and tap them out. This goes on until there is one (or two) students left and they "win." Some kids would have total meltdowns if they got tapped out. I eventually took this idea and reshaped it into a different game for preschoolers, I call the "People Garden." In the People Garden, everyone lies down on their backs and creates pathways using their bodies. Each student has a turn to "wake-up" and walk through the garden paths as anything they want to be - a butterfly, a cat, a train, a tiger, once a kid wanted to be a roller coaster. They walk all through the garden, they have their moment, they have all the attention, then tap the foot of someone else; they stand up and become whatever they want to be and the other student lies down in their spot. I love this end of class cool-down, but it is time consuming. There is no rushing the garden, so it is something that has to be planned for. I ran the story class for My Daddy is a Pretzel with the preschool groups which went very well. I am always a little unsure of how things are going to go with such a young group, but they surprise me each week with their enthusiasm and ability to stay engaged and on-task. Just like with the older kids, we practiced our snake breath, did our warm-up, and had a pre-reading discussion about jobs. This was actually funny. The best answer for what job does your mommy or daddy do? - "fire truck." Then we read the book. On the first page of the story, the illustration shows the kids sitting on colorful squares, a bunch of them piped-up "story squares!" Each week I pass out different colored felt squares called "story squares" to help keep the children in place during the story. They were very excited to see themselves reflected in the book. We read the book and tried out moves in our own way on our story squares - similar to the other groups. For pretzels, I had them all get twisty in their own way. Then we practiced the yoga poses standing up for "Yogi Says" and closed the group with the yoga dance party. They loved my green ukulele, which is becoming such a wonderful teaching tool, and it is so light and easy to transport. We played a variation of "freeze dance," when I play - you dance, when I stop - yoga pose. They did great with this. I made sure to call out all the different poses I saw, "I see a triangle, I see a tree, I see a bridge!" This was helpful to get all the kids participating and trying out different poses. One little guy was stuck on doing the lion pose and roaring at everyone, but once I started giving out the verbal attention, then he started trying new things. They all want to be noticed. Every class from preschool to kindergarten, they all say it "watch me!" It's cute and adorable, and they all do it, from the east to the west. The very last class ending pose was the rainbow pose. I have seen different versions of poses with this name, but what I had them do was lie down on their backs, relax, and look up into an imaginary sky with big white fluffy clouds going by - can you see them? Now look for the rainbow - can you see it? As the kids are lying down calmly and quietly, I pass out stickers, releasing them to their teachers. I try not to do stickers for every class. I want stickers to be a surprise at the end. For years, I didn't give out anything at the end of each class. I would wait until the final class to give each student a participation certificate - which they all love to get. It took me years to get over it and that stickers are ok. I was concerned that kids would lose the intrinsic value of the class and get too focused on stickers. This has not been the case. Even on the days where I don't (or forget or run out of time) to give stickers, I don't hear any complaints. They don't notice, because, I think, they just had a lot of fun and are leaving the group happy. So now, I have three booklets of stickers I keep in my Mary-Poppins-Like tote bag (along with scarves, tambourine, bells, a toy microphone, felt squares, and anything else I may need). It is good to keep things with you even if you don't plan on using it, sometimes, in the moment, you many need a plan B, or C, or D.
Yogi Says, Yoga Dance Party! Today I had so much fun with the kindergarteners and pre-kers for Story Story Dance! The story of the day is My Daddy is a Pretzel by Baron Baptiste (also listed on the Book Recommendations page). I also used yoga visuals from the Yoga Pretzels Yoga Cards (these cards are great, I incorporate them into these classes whenever I can). After the warm-up, we sat in our story circle and discussed the book cover. Then, I informed the children that the children in this story share the different jobs their moms and dads have. We then engaged in a discussion about jobs, or occupations and they shared the different jobs they knew or the one's of their parents. My favorite (and the most common answer) was "they work." Some children did in fact have parents who were "construction workers" an "architect" and "baker," like some of the children in the story. As we read along, we tried some of the poses. During story time, I limit movements to those we can do on our story mats (no standing activities). While on our story mat for this book, we made tree arms, we made triangles with our hands and fingers, airplane arms, fish faces, made pretzels with our arms by making them twisty, and stuck out our tongues for lion pose. The next half of the story dance class emphasizes axial (on the spot) and locomotor (through space) movement. We practiced triangle pose, tree pose, and mountain pose and played a round of "Yogi Says." For our end of class dance party, I busted out my ukulele and we played Yoga Freeze Dance! The is a new instrument for me and I am loving how fun it is to play and how easy it is to tote around (mine is a vibrant green with a sheen). While I played a tune, the children danced around. When I stopped and held the ukulele up over my head, they got into any yoga pose that we practiced during class. They seemed to have a lot of fun with this and it was interesting to see which poses they chose. For our very last pose, everyone laid down on their backs and pretended to be peaceful rainbows. A great ending. Today's classes were super fun. Story, children, yoga, and the ukulele go very well together. This week I led the autumn leaves class with the preschoolers. I modified the class slightly from the pre-k and kindergarten class. For the little ones, I called them up one at a time to jump over the leaves, stomp on the leaves, and the best part - roll over the leaves! It was really super cute and both preschool classes thought it hysterical when the leaves would stick to their own or their friend's clothes. Like the other classes, we ended with a leaf dance party. Every time I do classes with the leaves, there is an overwhelming expression of joy when they are gathering up leaves and throwing them up in the air to music. I remember in my neighborhood growing up, all the neighborhood kids would get together to rake leaf piles and then we would catapult ourselves into them. We would go from one backyard to another. I haven't jumped in a real leaf pile in probably over 20 years (sadly), but it is one of those joyful childhood experiences that stays with me. I think the child in me gets to come out and play with my students when we dance with the leaves and we all just feel, well, happy. Every fall, whatever version of creative movement I am teaching, I have to bring in the fall leaves. I do not use real leaves, they are too messy, I have these really nice cloth leaves in great fall colors - and they are long lasting. For the story dance class, I searched for a fall book about leaves that had great action words for the kids. When visiting a first grade classroom recently, I came across Autumn Leaves are Falling Down by Maria Fleming, (more on it in Book Recommendations). This book is full of actions the kids can do -and we did. The kindergarten group was my first group today. After the warm-up and passing-out story squares, we talked a little about the book and I invited them to try out the actions in the story on their squares. The story starts with leaves falling down; without any prompting from me to do this, they starting lifting their hands above their heads and made motions with their hands like leaves falling! I love when they do things that I don't expect them to do; these are the wonderful surprises of teaching. After the warm-up and the story - before the class concluding dance party - I ask students to line-up behind the "start square" (and show them where to end their turn, the "end square"). Each student took turns leaping over, creeping around, stomping on, and then rolling through the leaves. They loved this. Not only were students kinetically connecting with the language in the story, but by incorporating place language -on, over, through, under, above, between, in front of, behind, and so on - into movement, students also have a kinetic experience with foundations of mathematics. To end the class, we go over safe dancing rules - which includes getting to throw the leaves up and letting them fall (also in the story). They enjoyed dancing to the tambourine, free-styling, and bringing back moves from earlier. There were a lot of smiles today. They even saw cleaning-up all the leaves and putting them back in the bag as a treat; I didn't even ask, they just started doing it! They also seemed unmoved by the fact my speakers weren't working today, so I improvised with my tambourine. When I have the kids do leaps in class, I usually take it out and shake it dramatically, then SLAP it when they are midair, leaping over whatever it is they are leaping over - today that was leaves ( it's very exciting). Since the speakers were barely audible, I continued with it to finish the class. No one seemed to mind. They were pretty excited to dance in the leaves.